BBC correspondent Charles Wheeler has returned a painting to a German museum after discovering it was looted during World War II. 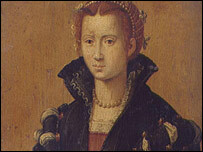 Wheeler received the 16th Century portrait of Eleonora of Toledo as a gift from a German farmer in 1952. He assumed it was a copy - but last year discovered the painting, by Florentine artist Alessandro Allori, was an original looted from Berlin. He returned the painting to the city's Gemaeldegalerie on Wednesday. "I'm rather pleased about it all," Wheeler told the BBC News website. "Instead of sitting on my bookshelf all these years, it's going to be exhibited properly." 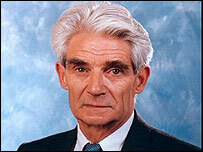 Wheeler is the BBC's longest-serving foreign correspondent, having joined the corporation in 1947. He was given the painting while working in the BBC's Berlin bureau in the 1950s. "We used to get a lot of visitors from East Germany coming in to chat, and some of them began to work for us," said Wheeler. "One of them was a peasant farmer from Frankfurt an der Oder area and one day he simply handed me this brown envelope which contained the painting. "He said it was a gift for my wedding. I told him I wasn't going to get married, but he said 'you will one day'." Wheeler carried the painting with him for the next 50 years to assignments in Delhi, Washington and Brussels. Recently, it has been propped up on a bookshelf in his UK home. But last year, while reporting on missing art for the BBC Radio 4 series Coming Home, he decided to find out the origins of the portrait. He took it to Anne Webber, co-chair of the Commission for Looted Art in Europe, and asked if she could find out where it came from. After hearing the story of how Wheeler had come by the painting, Webber sent photographs of the picture to galleries in Germany. "The Gemaeldegalerie immediately faxed back a black and white photograph of the painting from its records," said Wheeler. "They had no idea where it had gone, if it had been destroyed or looted by a Russian soldier," added Ms Webber. The Gemaeldegalerie is Berlin's state museum. It is believed to have lost around 400 works of art during World War II.